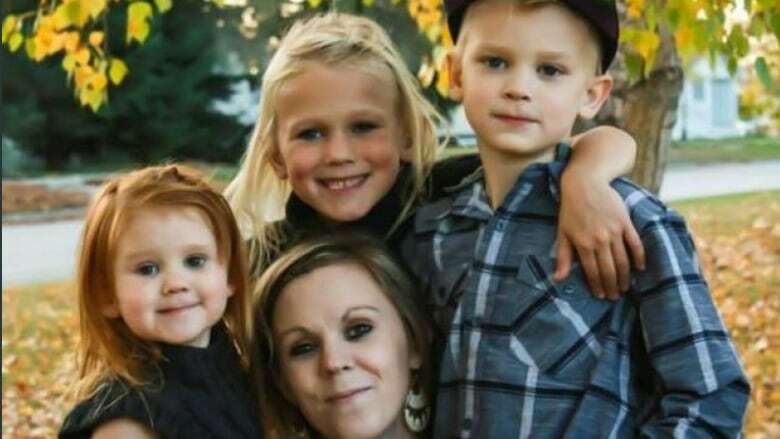 Several hundred people gathered in Nipawin, Sask., Friday to attend the funeral services for Latasha Gosling and three of her children. Latasha Gosling had four children. The youngest, the baby girl, was found unharmed and is in the care of family. (Family photo)Several hundred people gathered in Nipawin, Sask., Friday to attend the funeral services for Latasha Gosling and three of her children, who were found dead April 22 in their home in Tisdale, Sask., the victims of an apparent murder-suicide. The body of Steve O'Shaughnessy, the man believed to have killed them, was found later the same day by police in Prince Albert with an unharmed six-month-old girl, who is now being cared for by family. 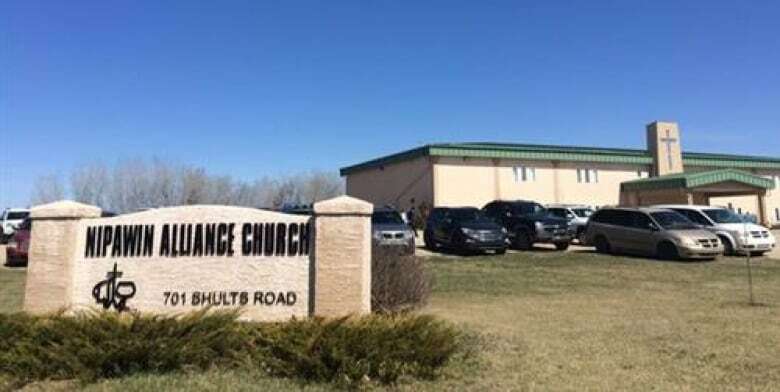 Gosling grew up in Nipawin, a small town about 60 kilometres north of Tisdale, and Friday's service filled the local church and an adjacent hall. "It's touched the core of a family," Rev. Lonnie Sims told mourners during the one-hour service. "You'd never wish this on anyone. [What we have is] paralyzing grief." In a eulogy that drew on remembrances from family members, Jenna Salisbury described Latasha, 27, as a "beautiful, joyful person" who loved her children and was loved and adored by them. "Latasha made everything possible to her children, with the sky being the limit," Salisbury said. Salisbury also spoke about the slain children. Jenika, 8, loved being a big sister and was starting to pursue a modelling career. Landan, 7, was described as bringing happiness to his father and was called "his little man." Janayah, 4, was the family's "fiery little redhead." The children's father, Jason Gosling, has been with family in the area since the tragedy. Latasha met him in 2005 and they married in 2008. He appeared visibly distraught at a candlelight vigil in Tisdale's town square on Wednesday night. 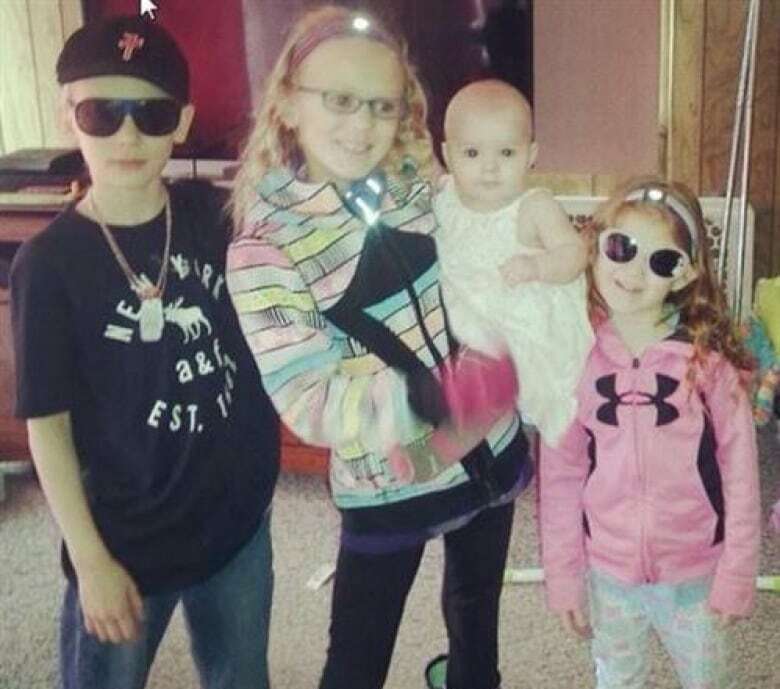 Latasha Gosling's fourth child, the baby girl found with the alleged killer, has been the focus of various fundraising efforts to provide for her future with some $60,000 raised so far. The circumstances of the killings have spurred discussions about domestic violence. Speakers at the candlelight vigil emphasized the need for people in dangerous situations to seek help. At the funeral, Sims urged mourners to find ways to heal from the tragedy. "There is hope, there is help," Sims said. "We can make choices that heal not hurt." Nipawin is about 270 kilometres northeast of Saskatoon. Tisdale is about 60 kilometres south of Nipawin. Police have said their investigation into the case has concluded but did not release details about what happened. CBC News has learned that O'Shaughnessy and Gosling were in a relationship at the time. Arnold Lester, a longtime friend of the family, said the deaths have rocked many. "It grieves my heart to think this could happen," Lester said. "I have children and grandchildren as well. And it's really a desperate situation." Evelyn Holoien, a cousin, said the outpouring of sympathy has been moving. "People really care and can help [the family] in this terrible time of tragedy," Holoien said. "That's what we really need is lots of friends to help us through this." Mother, 3 young children, slain in Tisdale, Sask.